The Apprentice star Sir Alan Sugar has begun legal action over a Sun front page story that alleged he was named on a “terror hit list”. …The businessman and TV star is understood to have been angry at the story, which he felt risked his personal security. 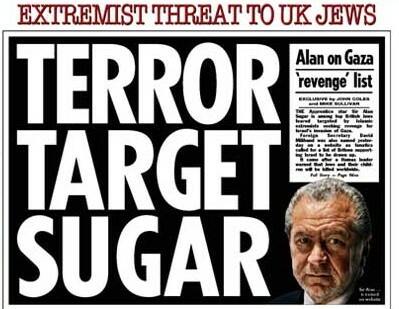 In the Sun’s January story, which was headlined “Terror Target Sugar”, it was alleged that Islamic extremists were targeting leading British Jews including Sugar in revenge for Israel’s invasion of Gaza. But the Sun doesn’t need to worry unduly – it has an impeccable source for its story, a self-styled “anti-terrorism expert” named Glen Jenvey, who will doubtless be giving evidence. Jenvey – who appeared as a pundit on the controversial Obsession DVD – has recently rebutted allegations that he fabricated the story by explaining that the Press Complaints Commission is in league with al-Qaeda and guilty of “hate crimes” (revelations which he has disseminated via anonymous postings to Wikipedia), and he has confounded critics by telling us that Guardian ran a report about the PCC’s investigation because the paper’s editor is conspiring to protect a Muslim who used to be a columnist for the paper’s website. What could go wrong? It has been more than 491 years since a Roman Catholic priest and doctor of theology, the Rev. Martin Luther of Germany, nailed his 95 theses to the schlosckirche (or castle church) door in Wittenberg…Benedict XVI’s recent decision to revoke his predecessor Pope John Paul II’s excommunication of four schismatic bishops of the ultra-conservative society of St. Pius X has evoked an uproar among Germany’s Catholic prelates – that is well nigh Lutheran…In view of all of these very serious protests by German Catholic clergy leaders, why on earth doesn’t Pope Benedict revoke his own revocation of Pope John Paul’s thoroughly well-justified excommunication of these extremist and illegally consecrated deniers of the Holocaust? First to set fire to their synagogues or schools and to bury and cover with dirt whatever will not burn, so that no man will ever again see a stone or cinder of them. This is to be done in honor of our Lord and of Christendom, so that God might see that we are Christians, and do not condone or knowingly tolerate such public lying, cursing, and blaspheming of his Son and of his Christians. For whatever we tolerated in the past unknowingly and I myself was unaware of it will be pardoned by God. But if we, now that we are informed, were to protect and shield such a house for the Jews, existing right before our very nose, in which they lie about, blaspheme, curse, vilify, and defame Christ and us (as was heard above), it would be the same as if we were doing all this and even worse ourselves, as we very well know. Rarely had a book stirred up such intense feelings. Hitoshi Igarashi, its Japanese translator, was stabbed to death. Ettore Capriolo, the Italian translator and William Nygaard, the book’s Norwegian publisher, were stabbed and shot respectively, although both survived. Bookshops were bombed and the tome was burned in public across the world. Mr Rushdie, fearing for his life, was forced into hiding. More recently, in 2004 we saw the murder of Theo van Gogh at the hands of an extremist offended by his Submission film, and his scriptwriter, Ayaan Hirsi Ali, remains under threat. The UK Bishop of Rochester, Dr Michael Nazir-Ali, has received death threats and is under police protection, and of course we all remember the sanguinary banners at the Danish cartoon protests. All this is, needless to say, an appalling state of affairs. 1. Patrick Sookhdeo and the Barnabas Fund. As I blogged just a few days ago, Sookhdeo has spoken of his “great hurt and distress” after his book Global Jihad got a bad review from Ben White, and the Barnabas Fund has told supporters that “we are very concerned for Patrick’s safety and that of his family” because a Muslim blogger who knows White concurred. In fact, though, Sookhdeo has provided no evidence of any threat, and his anti-Islam views have been public knowledge for a long time – this is more about Sookhdeo’s desire to take revenge on White, even at the cost of damaging the reputation of the Barnabas Fund. 2. Glen Jenvey. Jenvey is currently under investigation by the Press Complaints Commission over claims that he made pseudonymous postings to a Muslim discussion forum as a certain “abuislam” and then presented those postings to the Sun as evidence of extremism. The story was reported in the Guardian here. Jenvey alleges that the PCC is thus guilty of “hate crimes” against him and that it is protecting Al-Qaeda. Jenvey also alleges that the Guardian covered the story because the editor wished to protect a Muslim who wrote some columns for the paper some time ago, and who may be the real “abuislam”. While Jenvey has been swift to expound this bizarre conspiracy theory, he has not yet explained why “abuislam” shared the same identifying details as a certain “Richard Tims”, who posted to the same forum several months ago to promote a website owned by Jenvey. 3. Joseph Farah. In 2008 WorldNetDaily published a book about ex-Muslims called Why We Left Islam. Farah gleefully predicted riots across the Muslim world, but instead all that happened was that CAIR issued a statement pointing out that Farah was known for anti-Islam views and that the book should be ignored. Farah then laughably claimed it was unfair to suggest he was anti-Islam, and that CAIR had lied by suggesting he had run a column which suggested dropping pigs’ blood over Afghanistan. In fact, Farah has always been perfectly open with his anti-Islam views, and he had run a post-9/11 column which suggested (jokingly) putting pigs’ blood in Kabul’s water supply. Farah whined that CAIR’s “Hooper put a target on my back”, and he threatened to sue for libel. Obviously, this was a shameless attempt to concoct a death threat where none existed. There are other cases where death threats have been asserted, but curiously no police investigation appears to have followed. Presumably these characters think that no-one will dare to challenge them lest they be accused of supporting Islamic extremism. It seems to me, though, that crying “wolf” like this when people have been killed or had their lives blighted by real Islamic extremists is particularly distasteful and reprehensible.